Last week while I was in Lima I had breakfast a couple of times at a small, local restaurant by Benavides and Porta in Miraflores. A typical family business, there were 2 girls working in the front, a cook and his “ayudante” in the kitchen and dad keeping an eye on the place. Are you visiting Peru for vacation? When I told the girls I was from Belgica, they didn’t really know what to make of that, so I told them a bit about where Belgium is. “Between France, England and Germany.” After all, Belgium as we know it was created back in the day to be a buffer between those countries and keep them from going to war all the time, but that’s another story. I could tell right away the younger girl was taken back a bit and she became all quiet, while I kept eating my yummie pan con bisteck and her older sister went back to squeezing the lemons for that afternoon’s ceviche. “So what do you think about that Holandés Joran van der Sloot?” asked the younger girl after a while, kind of embarrased and not wanting to look straight at me any more. What could I say. I believe in “innocent until proven guilty” as much as anyone, but 2 young women are dead after they were both last seen alive with this guy. He destroyed the reputation of Aruba and now young women in Lima are on edge at the mere sight of a tall gringo. “I guess probably not all gringos are like that…” the girl said after a while. I hope the Dutch realize how much damage this guy has done to their reputation in Peru, with his picture in every tabloid newspaper until he gets convicted. 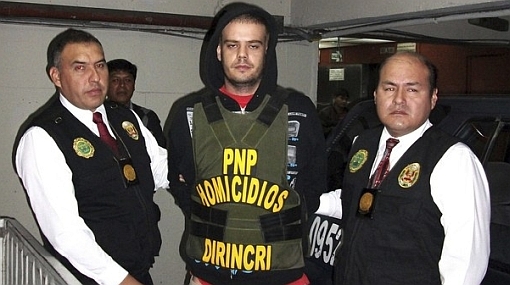 Worse, since there are essentially no guards inside Peruvian prisons, a psychopath like Joran Van Der Sloot may end up thriving in that environment. Note: check out Stuarts post on Peruvian prisons. This entry was tagged holandés, Joran van der Sloot, Lima, Peru, women. Bookmark the permalink.